Shutterstock/elbudThere’s more than one type of passport. Find out which one you should get. If you are applying for a passport, you’ll need to consider whether to get a passport book or a passport card. A passport card is cheaper than a passport book, but can’t be used for air travel and is only valid in Canada, Mexico, Bermuda, and the Caribbean. 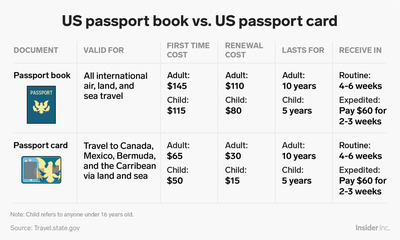 Passport cards cost $US65 for first-time passport holders, while passport books cost $US145. If you’re leaving for an international trip, your passport is the one essential item you can’t leave home without. 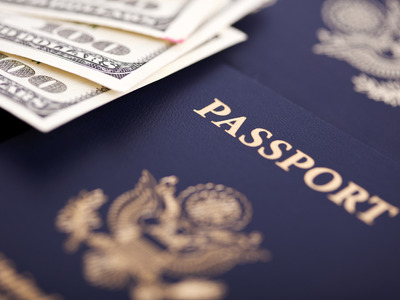 But the passport book that most Americans are familiar with isn’t the only kind of travel document available in the US – there’s also the passport card, which is made of plastic and is about the size of a credit card. The biggest difference between a passport book and passport card is that passport cards are only valid to enter Canada, Mexico, Bermuda, and Caribbean countries and territories (see the full list below) and can only be used at land border crossings or sea ports-of-entry. If you’re travelling by aeroplane, you’ll need to use a passport book no matter what. There’s also a price difference – passport cards are $US65 for first-time passport holders, compared to the $US145 fee of a passport book. Check out the differences between the two types of passport using the graphic below, and scroll down for the full list of countries and territories that will accept your US passport card.